The long-awaited detection of gravitational waves was announced with a clear and unmistakable note—it was a “chirp” that noticeably rose above the welter of background noise. It was the swan song of two roughly 30-Solar-mass black holes coalescing into a single spacetime-warping monster some 1.3 billion light-years away. 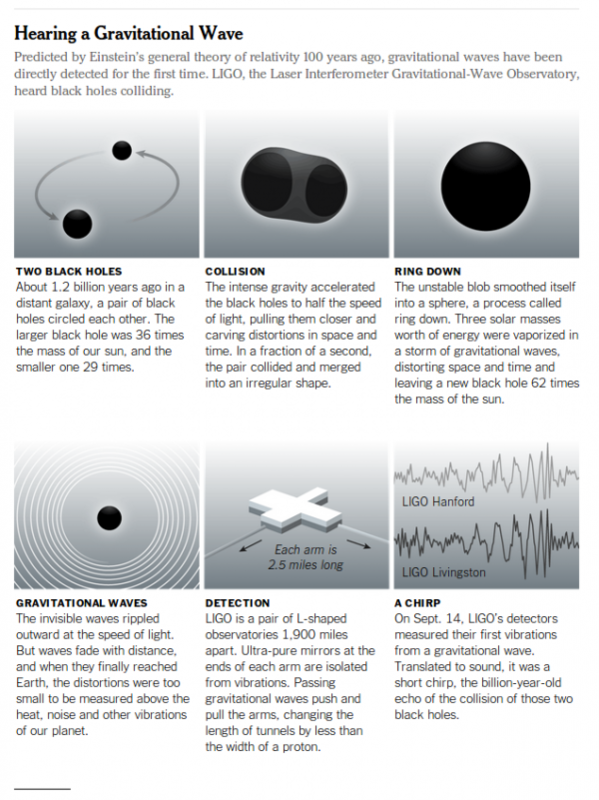 But such chirps may be few and far between, and now scientists at the Advanced Laser Interferometer Gravitational-Wave Observatory (LIGO) think they may be able to discern the distant roar of multiple black hole mergers in that background noise. The study, detailed in the April 1 issue of Physical Review Letters, predicts that scientists may be able to discover these ephemeral signals in as little as three years. Physicist Emanuele Berti of the University of Mississippi in Oxford, who is not a part of the Advanced LIGO team, was once very skeptical. “My honest opinion was, ‘I’m going to be lucky if we see this result in my lifetime,’” he says. The scientists think these much smaller, fainter signals are ripples of spacetime emanating from much more distant black hole mergers. Detecting them is akin to standing on a shore and attempting to identify waves originating in distant storms amidst the roar of the surf—that is to say, it ain’t easy. Currently, LIGO’s detectors are not sensitive enough to discriminate such faint ripples from the noise, but by comparing data discrepancies between LIGO’s Washington and Louisiana facilities, it might be possible to distinguish slight patterns betraying the existence of these distant mergers. If they could make these detections, scientists could figure out just how such black hole couples form, under what conditions they form, and how common they really are. Recent estimates of black hole mergers suggest they’re much more frequent than previously thought—and LIGO may be able to detect some 2,000 of them a year. It’s an exciting new era for astronomy—with gravitational waves, we can now “see” black holes, something that was never before possible. We can’t wait to see what else may be lurking out there. So We Found Gravitational Waves—What Now?